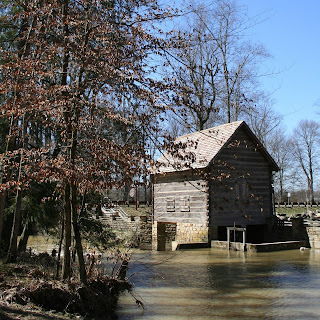 In Levi Jackson State Park, McHargue’s Mill was built on the banks of the Little Laurel River where it intersects Boone’s Trace. 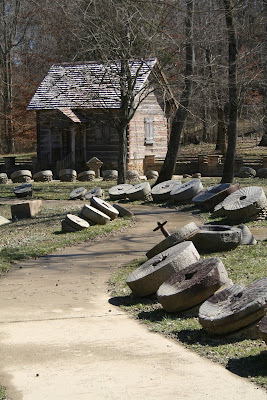 This mill is a working reproduction and has authentic interior works, including millstones. It is surrounded by what is said to be the largest display of millstones in the country. I visited here in hopes of getting a pretty picture of a water wheel. But, the wheel lays flat, hidden under the building. I was born in London, KY. I have been to Levi Jackson State Park many times. These pictures are indeed beautiful, and make me so homesick. in spite of that, I wish to thank you for this post. I plan to look at the rest of your blog because Kentucky is still my home, even though I live so far away now. I just wanted to say that the McHargue Mill is my family's mill. I'm a decedent from the McHargue family and also the Peters family, which is also a historical family in Kentucky. I absolutely love going to Kentucky to visit and it's really cool to go to the museum there and look at my family's history. If you can buy the corn meal that is made at the mill. You can pick it up at the State Park's museum store. Its the best corn meal I've ever had. the Feb./Mar. 2011 issue of "Country"
page picture on pages 24 and 25.
photo's of this lovely place.